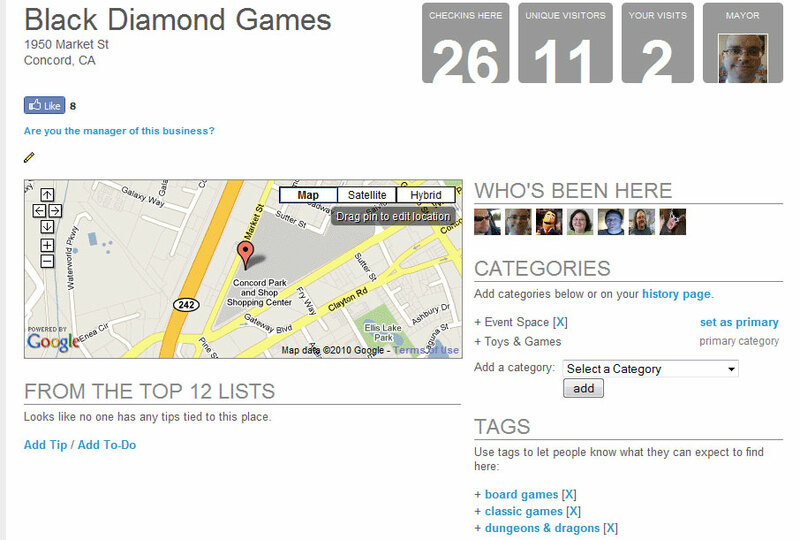 Black Diamond Games has signed up with Foursquare. Foursquare is a geo-location social networking service. Using a smart phone (or perhaps your iPad), you check into various locations, which usually links back to your Facebook or Twitter account. These types of services attempt to connect you with your friends in the real world. There are other benefits too, as businesses can use your location to provide you benefits, targeted at you when you check in. For example, last night we were out at Jack London Square in Oakland, having dinner at one of our favorite restaurants, Home of Chicken and Waffles. I checked in with Fousquare and was immediately told there was an offer nearby. Ben and Jerry's was having a three scoops for three dollars special. All I had to do was check in after I walked over. So guess where the family went after dinner? Granted, the Ben and Jerry's screwed up and they weren't offering the special until June 1st, creating ill will on my part, resulting in my blogging about it to over a hundred people, but done right, it's a pretty powerful marketing tool and a clever way to score some free or cheap stuff. However, like anything in marketing, you have to deliver on your offer. I'm pending business owner approval at Foursquare for the store, but once that's completed, I'll have specials available to those who check in often. Foursquare strikes a balance between customer friendly and business friendly. You can provide tips about a business, become "mayor" if you've been there more than anyone else, and generally make yourself useful. Businesses likewise can add information, provide incentives, and manage their relationship, as opposed to handing the relationship keys to the customers, who may or may not understand your business. This is in sharp contrast to the snarky, adversarial relationship one sees with Yelp. Yelp, you are wretched. 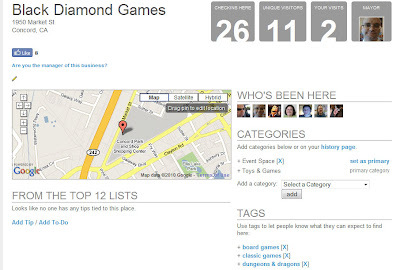 There are some fun elements to Foursquare, in contrast to your usual check-in system. You receive points for various activities and there are badges to collect. These incentives are a fun way to track your active lifestyle and compete with you friends. With my older peer group and with only about a million people signed up with Foursquare so far, for me it's mostly a game of solitaire. Like any social networking site (or any network), value increases when more people are added. It also adds to the ever faster flowing stream of information on Twitter and Facebook. However, if you're the silent type who never posts, and your friends are wondering if you fell of the planet, this might be a good thing for you. Foursquare is the leader in this tiny market segment, so I can't guarantee they'll be around tomorrow, won't get gobbled up by Google, Yahoo or Facebook or that the whole concept won't falls on its face next Tuesday. However, if you're a cutting edge, forward looking, social networking, smart phone using type of person, you might want to give it a try, even if it's just for the occasional Black Diamond Games coupon. Someone was asking me about how we choose RPGs and how they would get into our store. How we learn about them is pretty easy, we're on the look out for new ideas in role-playing games. We means myself and our staff. The staff, especially, are very much into cutting edge role-playing games. Because we try to foster that kind of creative atmosphere, customers will also ask for games along with keeping us up to date on various projects in the pipeline. Distributors are still the industry gatekeepers, and the majority of RPG product will come through them. It's just easier. Indie Press Revolution provides us with quite a bit of "fringe" product, that generally represents the cutting edge. None of this is particular extraordinary or new. The real question of getting into our store is not so much about the initial entrance, but more about how to get your product to stay. RPG publishers generally think of game stores in the context of the games they personally create. However, unlike say, a comic book store, only about 15-20% of our customers care at all about role-playing games. There will be no lines out the door on Free RPG Day. There is no day of the week when RPGs arrive, requiring us to hire additional staff. It's a niche of a niche. Of our RPG customers, over half only play D&D. It's not all doom and gloom though, because we'll carry a game with as little as two gaming groups supporting it. For example, we've got two guys who buy RIFTS products (one guy buys two of everything). That's enough to carry RIFTS. If one of those guys, gods forbid, was hit by a bus, we would re-evaluate. Part of my job is to talk to these two guys and regularly gauge their interests. Still playing? Any interest in the next supplement? That's the level of detail that goes into specialty retail. That's the level of decline RPGs have seen over the years. Still, it's the garden we grow and we're happy with it. So the market is very small to begin with, but it doesn't take much to turn the mental switch from pass to buy. The key is how to keep us stocking that product. The term thrown around in the game trade is the periodical model, in which I treat your book, which I have already sold once, which you have toiled over for months, as a mere magazine. I bring it in, I expose it to my crowd for one to six weeks, and then I get cold feet and drop it once it has sold. I never order it again. This is a subjective, voodoo retail decision that's based a lot on perceptions of customer interest, rather than data. If I only brought in one copy, it was probably already too risky. Not re-ordering it seems like a clear win. In game retailing, the difference between success and failure is often 1 and 0. It's great that I bought that book, but my confidence wasn't high enough to consider it a viable, long term product. How do you fix that? Assuming you want to fix this, that I'm worthy of your product, that I'm not lazy for turning your cool book into a disposable magazine, the first step is to show some confidence. This means you'll spend some time and/or money marketing the product (Facebook is insanely efficient). You'll need clear indication that there will be follow-up products, preferably with rough release dates and names. It assumes it didn't just show up one day at the distributor, with no previous solicitation, no street date, no consumer awareness. I'll also assume it's of standard quality, isn't of an odd form factor, bound at Kinko's or warps on the shelf. You'll convince me and your player base that there is more to come and this is just the beginning, not the end. If it's a core book, talk about future accessories. Support it with a preview PDF or a quickstart. Get it featured in an industry trade magazine. Bang the drum. Do something to ensure future life. Players erroneously believe that a game with no future supplements is dead, as if it can't stand on its own without a promise of more to come. If it is the only product, you've got an uphill battle. Create the illusion of life, even if you're uncertain. Customers regularly ask me if I know the future of a product line. Avoid letting this happen. Make it easy for me to buy it. Evil Hat is taking a calculated risk by sending Dresden Files RPG through the distribution system. Most retailers will not order direct due to the costs involved. To make it worthwhile usually requires a level of risk, in the form of a large amount of product that would be unacceptable for all but top tier RPGs. What's a successful, top tier RPG? One that "turns" or sells, three to four times a year (D&D is at an overall turn rate of 8 for us). Tell me I have to buy more than four copies of your game to make it cost effective and you're assuming de facto top tier status, probably without even realizing it. Mainstream board game companies do it all the time with their minimum case quantities. There's a reason game distribution works, and it's because of the very low turn rates of the trade. IPR is included in this system, in my book, so at least work with them. If I have to buy direct from you, it likely won't work unless you have multiple titles I need. Margin shouldn't be an issue, but it often is. Game stores have seen shrinking margins over the years without the ability to raise prices. Their costs continue to rise, so they get the squeeze. Some dry up and blow away, not knowing what happened. I know what's happening. I'll carry a book with a 45% margin, but I'll be cautious. At 40%, it better be pretty special and likely limited. When Diaspora was offered to us at 25%, we had to politely decline, despite intense customer interest. The quantities required and the difficult margin made the risk too great. At a full 50% margin, this issue goes away. You are now economically above average. Finally, there are factors that will make a product shiny, relative to margin or performance issues. There's a "halo effect" for indie press titles, for example. Right now, anything involving a PDF program, in which a publisher is working with retailers as partners, has a halo. I may order more of those products than I currently carry. I think everything good in role-playing for the last decade has come from the indie community, whether they published it or the ideas were borrowed. These modern design paradigms have shown up in D&D, Warhammer Fantasy Roleplay, and lately in Pathfinder. As a retailer, I want to be part of this. I want to show my support. I also want to pay my mortgage, as I don't have a WWGJ (wife with a good job) so charity and public service has its limits. Products with halo effects get special treatment and exemptions from the strict inventory control that inevitably sends almost every book to the clearance rack. I will also tell you that I have more RPG budget than there are viable products. I actually believe I have everything worth carrying based on my criteria. I strive to find more good product, rather than looking for excuses not to buy it. It's the local market that is shrunken, unemployed and disinterested, not me. Nearly half of our RPG section is now devoted to used books. That's a dangerous trend that says we're looking backwards instead of forwards. You may be telling yourself that the economics of all this just won't work. You're probably right! I don't want or expect access to every RPG product on the market. The low barrier to entry means everyone and their brother still wants to be an RPG publisher. Having done publishing, I don't see the appeal, but here we are. There is the long tail and the PDF market and the direct to consumer market. People will tell me it's not about the money, it's about art and expression. I'm not going to yell at you to get off my lawn, but I will insist that your product hold to some basic principles to make it into my store. 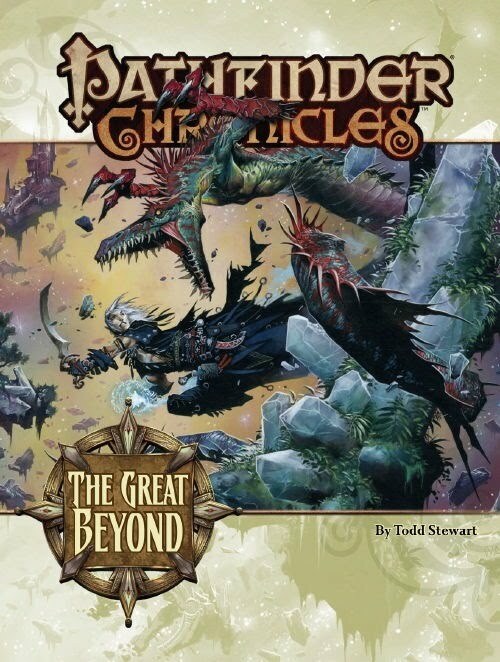 I've been reading one Pathfinder Chronicles book a week for the past month. This week I'm reading The Great Beyond, the planar book for the setting. It finally occurred to me why I like Pathfinder products so much.The model is a kinder, gentler version of "embrace and extend" from the software world. The products are intellectually compatible with what has come before. In other words, if there was subjective gravity on the Astral Plane in 3E, there is in Pathfinder (which means it probably matched 2E). In the case of this planar book, it has hints of flavor and mechanics going all the way back to Gygax and The Great Wheel, yet there's a feeling it could easily fit into AD&D 2nd Edition Planescape. Their approach embraces the past, while adding rarely seen depth. It avoids bizarre convoluted structures and name changes. Where they depart from canon and extend beyond is with their sophisticated explanations and tone. For example, I just finished reading Book of the Damned, Vol 1, an in depth look at Hell. It was chilling. In past editions of the game, there was a mechanistic view of the planes. Everyone had an alignment. When they died, they went to the plane that best suited them, a kind of personal heaven. Book of the Damned basically says you go to Hell because you've been deceived. They hate you. They tricked you. You will suffer for your hubris. Yes, you belong there, but it's no heaven. You will be tortured and abused for eternity. Was is worth it? Paizo isn't pulling any punches. The mechanics remain the same, but the reasoning has matured. There is a more serious tone to much of their accessories that takes the premise that this stuff is for adults. Stuff characters do matters. It's material that TSR/Wizards of the Coast would be afraid to publish. It's right up there with the excellent, mature writing I've seen from White Wolf. The Great Beyond continues with this extension of sophistication. There's an attempt to explain how reality works, not just describe it. For example, the entire transmigration of souls is discussed, from beginning to end. If this was ever done before in D&D, I haven't seen it. There's the origin on the positive energy plane, the souls journey to the prime material through star portals, the migration upon death and the various ways in which the soul can be captured or snagged, such as by hags in the shadow plane. There is no greater injustice in the mutiverse than an undeserving soul being ripped from its owners body and abused for eternity. Other planets and solar systems have a place in the planes, which is unusual to see. And of course, there are many shades of gray. The traditional D&D planar tradition is that everything has a place and in extreme measure. The Great Beyond goes over the various factions within a plane and why they act the way they do (or hints at least). They don't act good or evil because they're on the plane of good or evil. They have their reasons including quite a few grudges that go back to the beginning of time. So I'm becoming a fan boy it seems. If D&D is your game, I think it's fair to say that if you've wanted some sophistication, you usually had to look elsewhere. Perhaps third party publishers or perhaps another game system (such as the previously mentioned White Wolf). Paizo is not Wizards of the Coast, aka Hasbro, currently trading on the New York Stock Exchange for $39.53. They can take chances and be edgy without worrying about corporate or angry moms or quarterly profits. I haven't seen really good "official" D&D writing since second edition. Sure, the rules were good, but where was the writing? I guess you forget what you've been missing until you're re-introduced to it. The Great Recession has had an impact on the role-playing industry and it has reverberated down to us. Publishers have struggled, especially those who made just alright product that were bought primarily for idea mining, artwork or other purposes that didn't involve the value proposition of many hours of solid game play for a reasonable price. Some of those publishers are gone. Some have emphasized direct sales to capture more consumer dollars, leaving us without a viable local market. Some just don't seem to care anymore and may actually be on the way out, by way of neglecting their line. Although our RPG sales are down, I'm tentatively hopeful and optimistic about the future. The Dresden Files RPG is due late next month and we've had quite a few pre-orders (you get a PDF of the books at the time of purchase when you do so). Other PDF programs have popped up that we plan to engage with. Pathfinder has gone from the 4E protest game to a mature game in its own right, albeit not without competing directly with us with their direct sales. Their adventure paths are on very shaky ground with us, due mostly to their subscription system sucking up all the local sales. Companies that can partner with us will get the most attention. Those that directly compete with us will be under intense scrutiny, but as a merchant, they'll be sold nonetheless (but with no pity or quarter, unlike say, Indie press stuff). There is light and energy coming from the likes of Evil Hat, Pelgrane Press and Rogue Games. These companies are working to include retailers in the electronic value proposition by allowing us to provide free PDFs when a print product is purchased. Retailers need to stop belly aching and get on board. I think this is an inflection point, where there will be a dramatic change that will either upgrade brick and mortar retail for the future, or leave the entire lot in the dust. The methods for electronic participation is still being sorted out and there will likely be a variety of ways to participate, but the answer is to get on board, rather than to complain about the details. It will be messy at first, but that's alright. Otherwise I see a grim vision of the RPG future: RPGs will go the way of war games.They're increasingly sold directly to customers or in the case of Dungeons & Dragons, the print medium subverted by the electronic medium. The RPG industry is already a mere shadow of its former self. 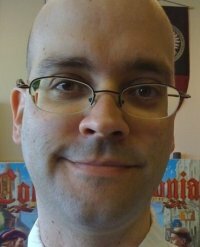 Erik Mona of Paizo says it's at 10% of its former glory in the '80's. He explains that when online gaming can provide the kind of AI decision making that a game master can provide, big change will be inevitable. My store will be increasingly irrelevant to fringe players, much as we are now to many war gamers. Sadly, we will fight a mighty battle but will ultimately fill that niche with something else. When that happens, when all RPGs are Dungeons & Dragons (ala Demolition Man), at least in a brick and mortar context (the only game with critical mass for retail sale), the marketing arm of the industry (me) will be lost. Players, increasingly grayer, increasingly rounder, increasingly looking like me, will shake their fist at the world at local gaming conventions, where they will play their long tailed RPGs into the sunset. That's my grim, Nostradamus-like vision. Lets work to fight against it. Publishers need to closely look at Evil Hat's PDF program. Retailers need to get on board with these innovative publishers, maybe even pushing those games that are represented by these forward thinkers. RPG consumers should re-consider the brick and mortar proposition as a value to the RPG world. Especially support those who support a hopeful future. I've found one of the economic necessities of running a game store is a legion of volunteers. If your store is in a region with relatively low expenses, you can use staff to perform the various tasks for which we use volunteers. Sales levels in the Midwest might allow for several full time employees, rather than a couple part timers, like expensive California. The other option is to work extremely long hours doing the job yourself, something that many game store owners do out of necessity or the inability or unwillingness to delegate. If you have control issues and think you can't run a quality store by hiring employees, imagine what you think will happen with volunteers, without a paycheck to seemingly drive their performance. Bringing in volunteers is an act of faith. Surprisingly, they do a wonderful job, despite slim to no material compensation. Enthusiasm for a game or belief that the store is important to the community drives them to work hard. We have very few problems with them, provided we carefully define their boundaries (what we want them to do) and their interests (what they're willing to do).With a balance of freedom in how they run their event and responsibility in what they need to do, they usually do a fantastic job, needing no more direction than an employee. Event Volunteers. Nothing can match the enthusiasm and in-depth knowledge of our event volunteers. I won't name names, but these folks keep our events running smoothly, provide us with information about their game, and maintain community interest. There is simply no way our staff could run all the events or even maintain knowledge about all their games. Stores without these types of knowledgeable volunteers often make the decision to not support these games, since they neither understand nor wish to personally run events for them. However, we run a business, rather than a club house and as the only full spectrum* game store in the county, people expect us to support any viable hobby game out there, which we do. By the way, If you think our store inventory is an inch deep and a mile wide, well, that's my general feeling about the Contra Costa County gaming community. I sometimes look with envy at urban stores with specializations. The bottom line is we support the games people play, rather than our personal agenda of what we think is worth playing (which changes all the time anyway). If there's enough critical mass for an event, enough fans who want to volunteer and get behind their game, the game tends to do well. At times, I'll step in and pay staff to run an event that I think should be getting more attention, like Flames of War or Warhammer Fantasy. If this doesn't jump start interest, I step back and wait for that community to materialize. We're always looking for more volunteers to run an event, which often requires as little as showing up at a particular time each week to play. However, I accept that some games won't get on the schedule. With the volunteer model, I don't feel it's my responsibility to force the issue, something I recently argued about with one game company. If I were to just put the work into their game, I could be successful with it. My response: That's true about anything, so why you? We have event volunteers for Warhammer 40K, board game night, Pokemon, Magic, Dungeons & Dragons RPGA, Pathfinder Society, Yu-Gi-Oh and Naruto. I count twelve total, but I'm probably off. Without these volunteers, most of these events wouldn't happen. Store Boosters. Besides event volunteers, we also have a loose group of store volunteers. These are boosters of sorts, who can be called upon to help us with big events or to just stand at the counter and look official while I run to the restroom. If a customer has a question about a game, it's not uncommon for me to "tag" a knowledgeable booster to provide some detailed information. Our store volunteers can be relied on to help us set up auctions, unpack giant shipments, or run specialized events like mini-cons. Some of them are event volunteers, but they tend to transcend that role, often acting as informal advisors, consultants, and "man on the street," taking the pulse of our game center population. Some get emails requesting their opinion about new games or events. Joe and Dave are our longest running boosters. Some end up becoming investors or employees. What does this mean? I have a hard time thinking of a business that relies this heavily on volunteer effort. Volunteerism is common in community organizations and non-profits. It's the need to form up in groups to do what we enjoy that drives a store like ours to create this type of structure. To me it stresses the importance of events, but it also indicates that as a business model, the event focused game store is on some shaky ground. If you think the job of omnisciently managing inventory is difficult, try keeping staff and a dozen volunteers happy. I take it for granted sometime, but this is also the real strength of an independent game store. It's what keeps the Wal-Marts and Targets of the world from eating our lunch. Why? Because it's too hard. It's bad business. It's passion over common sense. It's hard to quantify and measure. It involves elements out of our control. There is unforeseen risk. Both the cost and benefit are difficult to measure. On the plus side, it's the reason for our existence. We support the community by providing a place to play and we're rewarded accordingly. The community in turn supports us by making purchases from our store. Events don't make money, they drive sales. There are actually far more people who shop at our store than play at our store. They will flat out tell me that although they don't play here, they support us because we provide that opportunity. It's what keeps them buying local rather than purchasing everything online. My guess is about 20% of our customers use the game center. Heck, of those who sign up for our events email list, only half ever open the message. Yet, our early sales numbers from a few years ago showed that having the same inventory in our new store, but with running events with longer store hours, boosted sales 60%. I will often tell people that keeping the events going is the bane of my existence. What I really mean to say is it's where the work is. Every job seems to have that element. I enjoy purchasing and finance and even some of the marketing, but events are hard. I rely very heavily on my staff to coordinate them as well, since I'm not there in the evenings. Luckily, they understand the needs of the store and do a fantastic job of both managing volunteers, and devising a patchwork of various schemes to keep them all happy. They may get paid, but my staff go above and beyond in managing this circus. They're unsung heroes too. * full spectrum. The term that used to be define a good game store was full line. Full line means you carry every game from every line you carry. For example, you would carry every Rio Grande board game or every Warhammer Fantasy model. Most game stores can't support full lines, at least not of everything, since this would require a huge amount of money. I like the term "full spectrum" as it denotes a wide range of game categories: board games, miniature games, role-playing games, collectible cards and miniatures, and classic games. It's a best of breed approach. Few game stores are full line anymore (and nobody would ever build one nowadays), but I think a good game store should strive for full spectrum. We sell role-playing games into six figures each year, and although they're on the down cycle, I always wondered exactly what was selling. I know turn rates for individual games. I know what's doing very well right now (Pathfinder), our most under-performing game (Traveller) and the game that has me confounded with its wonky sales patterns (D&D 4). What I didn't know, is exactly what people were buying. Core rulebooks always got me excited. There's nothing more promising than a core rulebook. It's the most bang for your buck, the evergreen of its line, the last thing to drop and the games linchpin. Games with core rulebooks out of print might as well be on vacation. Nobody will buy that game. It has the stink of death about it (take note Paizo). Publishers usually see it this way too, and I'm pretty sure the only sure thing in RPGs is you'll sell a lot of your core rulebook. Accessories and adventures are nice, but not necessary. Most players will at least buy a core rulebook, while the common wisdom is that the game master will likely pick up the accessories and possibly the adventures. But is that true? What are the ratios? It's an idiosyncratic question from a point-of-sale perspective, since we generally don't care whether a game book is core, accessory or adventure. We track by game system and that's considered fairly sophisticated. Half the game stores out there use a cash register. So lacking any stunning insights on the game trade, and with the family sleeping, I began the meditative task of crunching some numbers (when I should have been meditating). Accessories are 60% of our sales, core rulebooks 35% and adventures 5%. Adventures are the red headed step child of the RPG world. Nobody really wants to bring them out, yet they're part of the family and fans demand them. This is especially true in "crunch heavy" games like D&D and their variants, where walking across the floor can have a paragraph of rules. When a publisher puts out an adventure as a PDF, I actually breathe a sigh of relief. These numbers didn't make much sense to me. Where were the overwhelming sales of core rulebooks? So I dug a little deeper. When I look at profit per item, core rulebooks outsell accessories two to one, and accessories outsell adventures two to one. Adventures are the retail equivalent of community service, a convenience for our customers. They're the board game equivalent of Candyland, sitting quietly on the shelf, a re-assuring sign that we carry the full spectrum. So you can see why I get excited about a core rulebook and sigh in resignation at a new adventure. 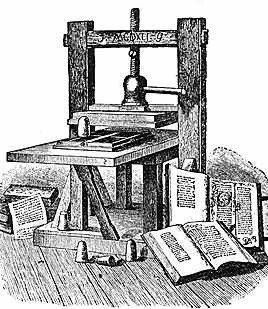 Many publishers don't even print them anymore. In their defense, I will admit they tend to skew slightly lower in price than the other products. The overall sales chart represents the raw stuff on the shelves. There are vastly more accessories than core books, overall. Often the core rulebooks were sold years before, and the accessories are keeping the game alive. It's the per profit sale per category that seems to tell the narrative I was looking for, and it's a familiar one. Envision these numbers for a D&D group using the profit numbers. We've got four players total. Each player and the DM buy a core rulebook (4). An accessory comes out, perhaps a book on rogues. It's fairly useful for the entire group, but do all five people buy it? Heck no. The DM picks one up, because he's really into the game, and perhaps one player, the guy playing the rogue (2). Then the adventure arrives, the Quest for Dwindling Profits, the much promised adventure about gnomes and their complex loan system based on borrowing against the value of powerful magic items. The DM probably picks it up (1ish), but he might not. It's based in a coastal town and he's running a desert campaign. Or perhaps he hates gnomes. Or he's been traumatized by other financially oriented adventures. Perhaps he scoffs at pre-published adventures and gets his creative fix by writing his own. In any case, slightly less than one per group is the likely sales outcome for adventures. Let me know what you think, especially the relationship between gross sales and profit per item. I think there's still something I'm missing. Could we say that every group buys twice as many accessories as core books? That would mean our group of four would buy eight accessory books for their game. I advertise heavily on Facebook. What would be a fortune in TV advertising, which I've spent for years with mixed results at best, is a pittance on Facebook. I can experiment and try all kinds of things. I've got an ad on your birthday, an ad for the Yu-Gi-Oh Duel Terminals, you name it. I've got six ad campaigns going at any given time. This is because ads are profoundly well targeted and there's no risk if they don't work. Nobody has clicked on that birthday ad yet. Yes, glass half-empty people will point out that "hit rates" are far less than one percent (about .04% for us). Who cares? If I'm only paying for those who click, it's not like I need to make grand judgments about the hundreds of thousands who don't. It's like putting down procreation because only one sperm fertilizes the egg. Oh pity all those poor swimmers; wouldn't a test tube be more humane? I'll also point out the old marketing rule that it takes about nine impressions before a potential customer will act. Theoretically, these low hit counts should work over time. I don't want to act like I'm defending Internet advertising. I don't need to. I do it because it works. I also want to point out that it's not evil, unlike Yelp. I can't target my competitors and Facebook doesn't encourage me to advertise by preventing this. It's fairly benign. How does it work? We've learned not to use it to drive people to our store, or for events or for sales. Facebook ads work to connect people to our Facebook page. We're number nine worldwide for game store fans on Facebook and a lot of this is our advertising campaign combined with working very hard to provide good information to those who sign up. This results in informed customers who act on our information, often near instantly. I have information I want you to know. You want to know it. Facebook is good at presenting it. If I wanted to have a sale when we first started, I would spend hours designing a postcard, possibly hiring someone to do it, hundreds of dollars in postage and wait a week or so before customers trickled in. Since no single department is more than 20% of our sales, it meant that any departmental sale had an 80% marketing expense wastage. Therefore, we rarely had these kinds of sales. A few years ago, Email might have been the solution. However, email has problems. It's considered more intrusive. If I sent you 60 email a month, you would disengage almost immediately. However, two updates a day on Facebook is not considered extreme. Also, since 80% of what I post is of no interest to you (for some of our multi-genre gamers, it's as low as 40%, looking at our survey results), it's easier to let it flow off your back, duck-like. Some still prefer email, but they inevitably get far less information from us than Facebook and Twitter. So yes, Facebook advertising works great, which is why I want to mention that all these erroneous "I will not pay for Facebook when it goes to $3.99/month on next Tuesday" pages are total crap. I am paying for your Facebook use. I want you to have it for free. Really. I also need a reasonable amount of your personal information for my marketing to continue my ad campaigns. I'm not saying that Facebook's privacy policies are good, because they're troubling. I am saying, and nobody seems to have mentioned this, that as an advertiser, I need your anonymous personal information to target my ad programs and I need you happy about it. Without that information and a happy you on Facebook, the system dies. One of the tools for determining if inventory is working for a store is to use sales per square foot. This is especially true in urban stores and very small stores, where there is a very high opportunity cost for displaying merchandise. Products need to earn their place, and larger products need to earn it even more. Sales per square foot is another tool you can use in addition to turn rate analysis, which rates merchandise on how often it sells. You can use these two together, always keeping in mind the space your merchandise requires. For example, you might have a slow selling miniature game that has just a couple of turns. If these were board games, where a $50 box could take up a couple of square feet by itself, you might be obliged to dump it. However, that same product space in miniatures might include $300 in models. Suddenly turn rates take a back seat to sales per square foot. Likewise, a four turn $100 poker table top might be considered a solid choice under turn rate analysis, but when you realize you could stock $6,000 in miniatures in the same space, it might now be considered an enormous space hog that has to go. You can use your overhead numbers to calculate how much it costs to stock an item per square foot, but to keep it simple, just consider a product or department in relation to the rest of the store. This all sounds theoretical, but when your store is small, like our last store, sales per square foot plays an important role. In my 900 square foot store, stocking a new collectible card game was an obvious choice. During the CCG boom, we sold over 35 different games. CCGs took up an insanely small amount of space. Each CCG takes up half a square foot at best, turns at between 8-100 times a year and requires a tiny amount of inventory at any given time. Nowadays, there aren't that many good sellers (we have five), but back then it was easy money. Small stores will always benefit from CCG sales and many "card shops" can maintain a small presence because of sales per square foot. Providing the necessary game space is another issue, as high sales per square foot items, like CCGs, CMGs and miniature games, tend to require lots of organized play to boost sales. 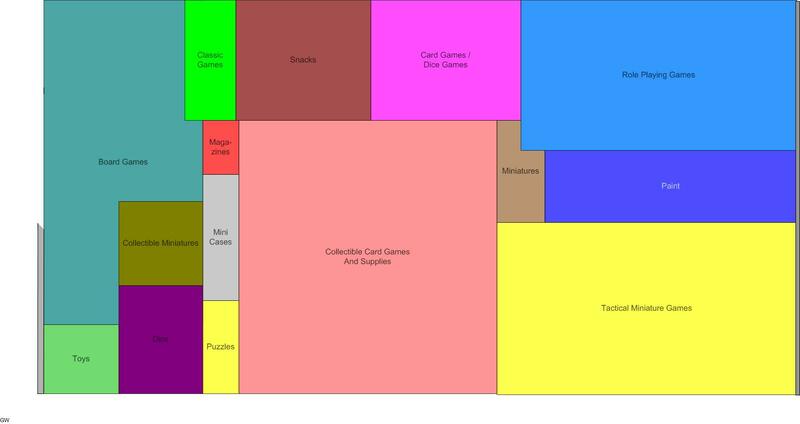 Miniature games are most dependent on play space to drive sales, even moreso than CCGs. 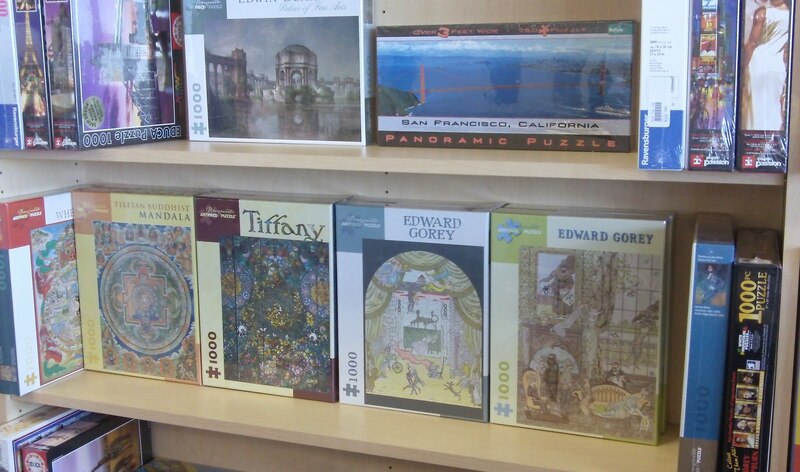 Classic games and jigsaw puzzles are the pigs, and combined with slow turns for most hobby stores, they're usually considered window dressing at best. So a small store should definitely focus on high turn, low space product lines, but to stay in business, they also need to maintain a high level of diversification. There will be some necessary evils, such as average space consuming departments, like board games and RPGs, but they should avoid the space hogs. This is generally understood by small store owners, but using metrics justifies what they know intuitively. 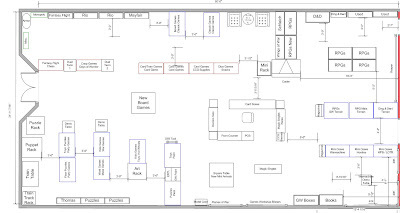 Below is the layout of our store right now, created with Microsoft Visio. 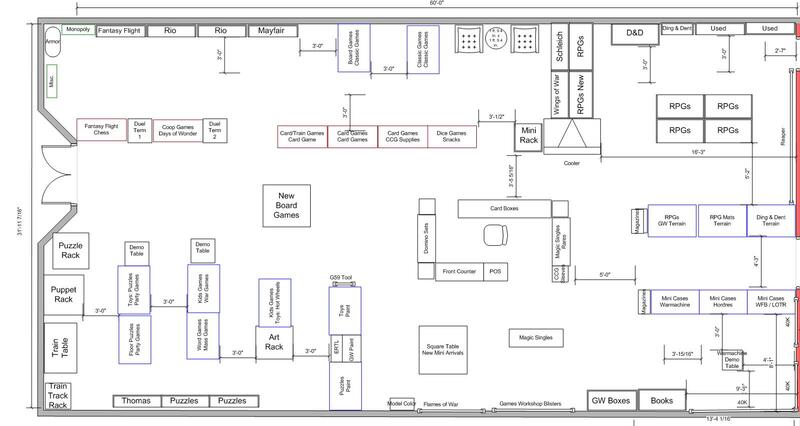 You can see the various departments: RPGs top right, tactical miniature games at bottom right, board and card games at the top left, and toys, puzzles and party games at bottom left. 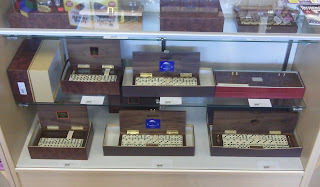 We sell CCGs in two of the display cases in the center of the store. Look at the space each department consumes. No department is more than around 20%, which shows our diversification. What you rarely consider is whether the space a game consumes was earned. 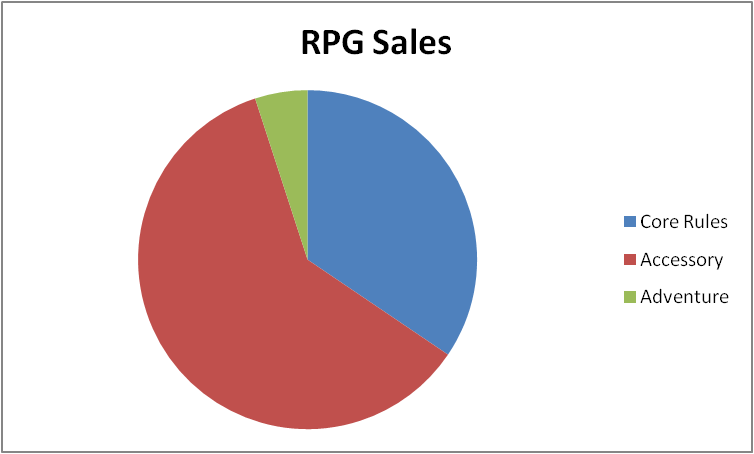 Does the RPG section still warrant it's space with declining sales? Do CCGs deserve a little more prominence with their high sales? Are some departments, like toys and puzzles hogging space based on their high square footage and lagging sales? All of these questions are moot if you don't need the extra space. As space gets tight, it's not uncommon for me to begin envisioning which departments should be rewarded and which should be penalized for their sales performance. Calculating sales per square foot provides metrics for this perception. Below are my sales per square foot in a handy diagram. You immediately notice departments that are represented larger than their physical space. CCGs are obviously highly efficient space users. Toys and classic games fail to perform, as expected. Board games seem inefficient despite record sales. Again, if you do turn rate analysis, you already have a "hit list" of departments that seem to be under-performing. There's also the up-side of turn rate analysis, in which high turn departments can indicate they need more stock. So is all this navel gazing helpful? Would I be better off at the store right now giving board game demos? Do you need these tools? The bottom line: It works for me. Owning your own business is terrifying and any tool or process that can create some solidity in a highly fluid environment is most welcome. Tools and inventory metrics will absolutely not save you from product ignorance, bad customer service, a dirty or cluttered store, or not enough capital. However, if you planned ahead and included all those things in your baseline, I strongly believe metrics can provide an impartial, accurate look at how your inventory is performing. I see my store as a high performance race car. Without proper capitalization, I can't get a quality car in the race or a qualified driver behind the wheel. My inventory is my economic engine and my tools and metrics let me fine tune it, tweaking out ever more horsepower from the same block of metal. You can over-tweak the engine and blow it if you bury your head in your graphs and charts. However, if you listen to the entire car hum, if you can grasp the totality of your entire business, you can avoid catastrophe and maximize your performance. If this sounds like a game I'm playing, you're absolutely right. As the economy improves, we've begun expanding back into more mainstream areas of the game world, such as children's games, classic games and puzzles. The general public, unlike hobbyists, cut way back on their game purchases when the economy was in trouble. Our sales of chess sets, jigsaw puzzles, and toys plummeted in 2009, while our overall sales were up about 12%. I'm no economist, but I think we're generally out of the woods, with demand for mainstream games picking up, albeit with a more cautious consumer. There is a smaller market for luxury items, but a larger market for safer. mainstream items. Still, there's a price point for everyone and we made it a point to round out our classic games with some high quality, albeit expensive, domino and cribbage sets. Likewise, we're betting that parents will have a renewed interest in fun, educational games for their kids. It's an area that we've struggled with for years, mostly because we haven't had the clientele and the game trade is poor at kids games, but we're committed to expanding in this area. 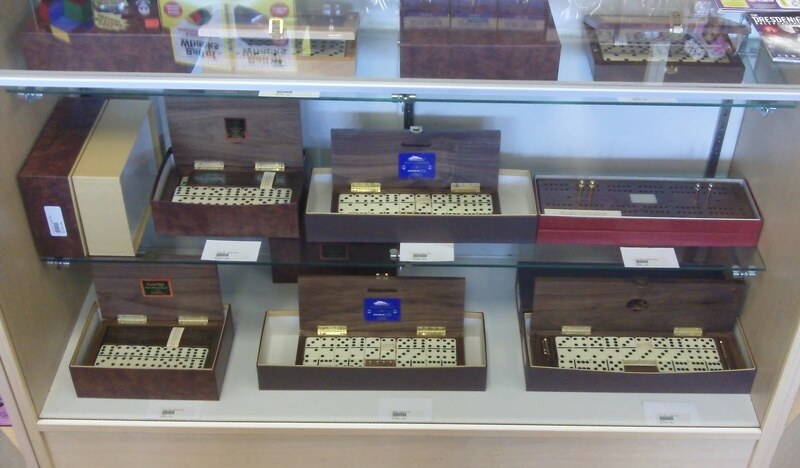 Last week we added the full line of premium domino and cribbage sets from the Alex Cramer Company. This family owned business in Southern California has been making beautiful, hand made sets for decades. We've been asked for premium sets for years, but never had a source until I stumbled upon them at another game store. 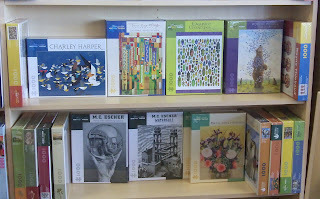 Our Ravensburger puzzles have been selling well, along with Educa, but we wanted a broader selection. 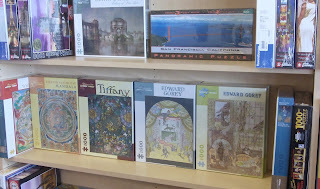 Pomegranate is a paper company in Petaluma that makes 1,000 piece jigsaw puzzles by popular artists like Edward Gorey and Escher. 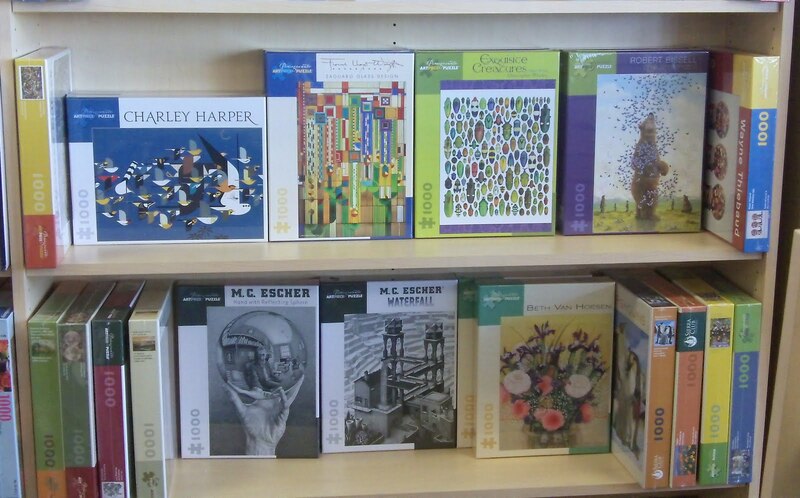 We've been slowly growing our puzzle crowd over the last couple of years, and I think they'll like these. The game trade does a horrible job with kids games. It's mostly a niche filled by toy companies who sell direct. We recently opened a Habba account to get at their excellent games, and we're planning to expand other lines. Yesterday we brought in a Gamewright rack with a bunch of additional card games. These are popular, inexpensive. mainstream card games that many of our parents like. Finally, we've paid attention to our customers requesting dice games. 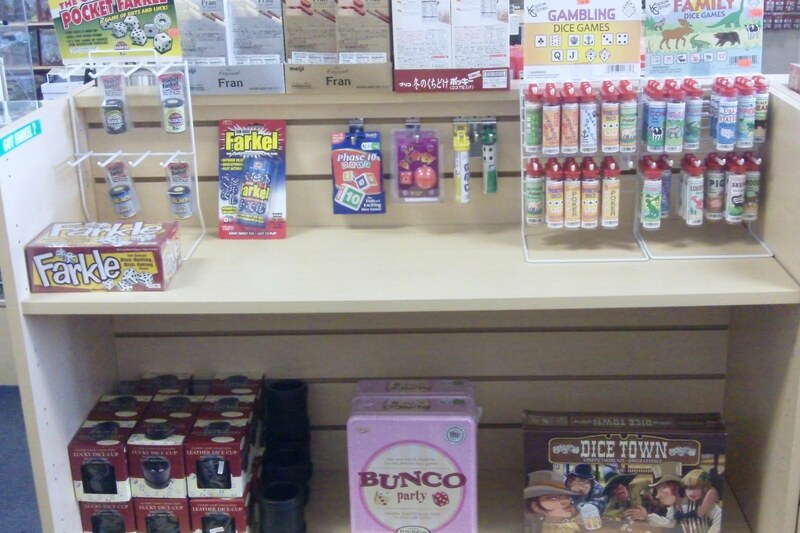 We've brought in a variety of dice games and have stocked our dice cups deeper. Not shown here are other classic games, including additional checkers and chess sets, bridge cards and bridge score pads. We also found a source for Pressman games, and brought in the first half of our Pressman order, including Tri-Ominoes, Rummikub, Mastermind, branded games like Jeopardy and Wheel of Fortune and their line of domino sets. Hey, grandma gets to play games too. So what about the hobbyist? We're in this wonderful position of having enough inventory to satisfy most needs, and solid inventory systems in place to cycle out older inventory so we always bring in the new releases. Our strong 40K sales have strained the budget of late, but overall sales are strong enough to compensate. Besides 40K, we've been able to expand in other areas too, such as Malifaux, Pathfinder and a broader selection of card sleeves. Also, most game sales are fairly flat, except board games and CCGs. Whenever you're cursing CCG players (we all do at times), I'll just point out that CCG sales have kept the store in the black over the last year. Inventory is a zero sum game. Something had to go for all this new stuff to arrive. Toys have fueled a lot of this transition, as we move far, far away from our initial diversification attempts. I've even accepted that a lot of good selling toys just don't meet our objectives, so they must go too. A lot of miniature games have hit the discount bin as well, such as all but our core Lord of the Rings sets, initially ramped up for the War of the Rings release, Firestorm Armada, Infinity and most of our "indie" miniature section. The indie minis were a good idea in the old economy, but failed miserably in the penny pinching new economy. Collectible miniatures are officially dead as well, with the last Star Wars minis release behind us (SW is on clearance at 40% off) and all the D&D minis moving to semi-collectible. Our minis rack is slated for removal soon. I've always wanted to be behind the scenes, rather than out in front of my business, but that's just not how it works, at least not if you want to be successful. There's a certain level of small business self-promotion that's required, and I have to admit it often makes me uncomfortable. Nevertheless, I must own this circus that I'm running and that includes standing in front of the big tent and inviting people to behold the wonders within. Step right up! Gary Ray is owner of Black Diamond Games in Concord, California, the premiere game store in Contra Costa County celebrating its seventh year. He has an undergrad degree from San Diego State University in Asian Studies and a MA with honors from Graduate Theological Union in Berkeley. Studying classical Tibetan and writing his honors thesis, Tendai Influences on Dōgen's Concepts of Enlightenment, qualified Gary to bus tables in a sushi restaurant. Luckily he had other interests. Gary was interested in computers, especially connecting American Buddhists electronically in the pre-web era. He was co-founder of Tiger Team Buddhist Online Service and editor of CyberSangha magazine. This eventually resulted in meaningful IT employment around the time of the dot-com boom. He became very good at spending other peoples money, mastering terms like "burn rate" and observing esoteric business practices, like selling products at a loss in hopes of making it up in volume. Anyone who could combine a noun and a verb into a company name was a genius during these times. These practices are not generally recommended when spending your own money. While working in IT, Gary enjoyed running elaborate Dungeons & Dragons games, usually requiring obscure gaming supplies that Bay Area game stores neither stocked nor could successfully special order due to their general lack of competence. This got him thinking, and combined with a general hatred of the IT field, one which most of his IT peers shared, he took up a vow of poverty in hopes of running a better game store. Astonishingly, it worked. Since starting the store, Gary has dabbled in Euro board games, enjoys playing Warhammer 40K (Imperial Guard Tallarns FTW), and of course, engages in his true gaming love, Dungeons & Dragons -- currently Pathfinder. He played Magic: The Gathering, back in the day and has dabbled in other RPGs, but it's that love of D&D and those esoteric accessories that excite him. 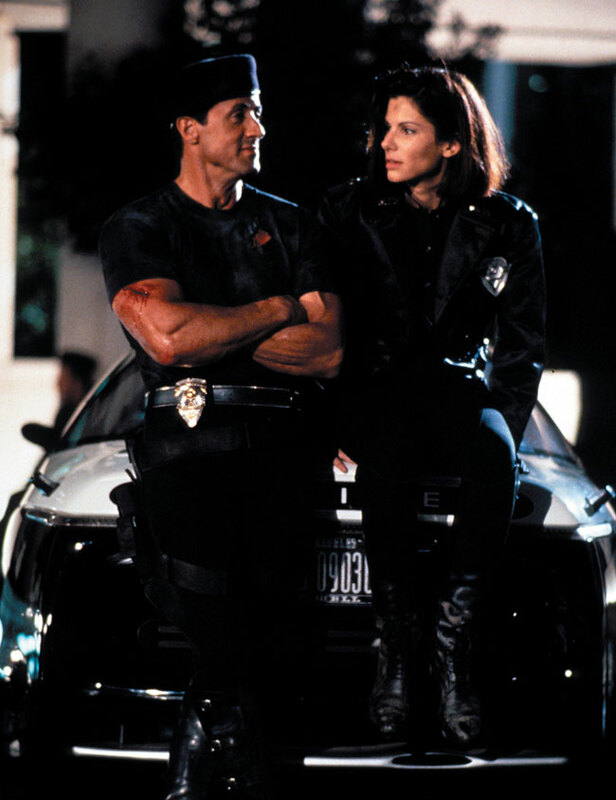 Gary is also married with a six your old son named Rocco who's obsessed with Hot Wheels and time travel. When not working, painting miniatures, planning a D&D game, or writing in the third person, his priority is family time.